The Great Plains Audio 604-8H III Rev. 2 is more than just an evolution in the classic series of 604 Duplexes, it’s an AUDIO REVELATION! For more than fifty years, there has been one studio monitor loudspeaker that has been the defacto standard by which all others have been measured. Though it has been through various generations, it is still known by the simple model number which graced the very first unit manufactured – 604. The popularity of this outstanding loudspeaker grew until, by the 1970’s, 604-based systems were used in more recording studios than all other types combined. It’s ability to reproduce program material with stunning transparency is legendary. During the 1980’s and 1990’s, both playback and performing rooms underwent drastic changes that significantly deadened them. Smaller speaker systems became the aural monitors of choice for many studios. Recently, however, many veteran artists and producers, dissatisfied with the unnatural results of these changes, have led the industry to return to more realistic, live-sound environment in both the recording studio and performance venues. In addition, many of the newest generation of producers and artists are beginning to experience the tremendous differences a recording studio with live rooms and large loudspeaker systems are capable of. As a result, more and more are specifying this exciting environment for their newest creative works. Now, more than ever, it has become obvious that nothing produces a more natural, live-sound experience in rooms of this type than does a large, 604-based speaker system. 604 was no exception. Here at Great Plains Audio, we receive more inquiries and have more discussions with people about the 604 than for any other loudspeaker we manufacture. Those interested cover a wide wide spectrum – everything from studio recording engineers to serious home audio enthusiasts As we listened to all of them, we began to understand the needs and desires of the current generation of audio professionals and private system users. Almost without exception, they expressed a desire for extended, smooth high-frequency response, articulate midrange response, and clean, accurate bass performance. The result of exhaustive research and testing is what we believe is the best sounding yet in the 604 family, the Great Plains Audio Model 604-8H, Series III, Rev II. When applied to loudspeakers, the term “digital-ready” usually implies that the product is able to handle the enhanced dynamics that are now technologically available from digitally processed sound. The new, super-efficient Model 604-8H-III is capable of handling the dynamics of sound from any medium far better than any of the smaller, low efficiency loudspeaker available today. The new 604-8H, Series III, Rev. II is a 15-inch (381 mm), low frequency loudspeaker coupled to a one-inch (25 mm), highfrequency compression driver, both mounted to a single 16-inch (406 mm) diameter frame. Each component is structurally, magnetically, electrically, and mechanically independent of the other. 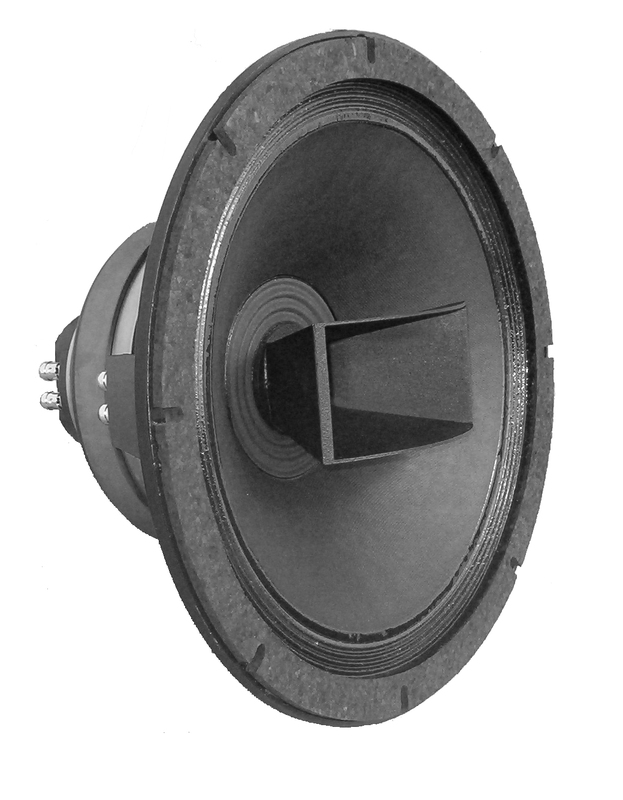 The low frequency loudspeaker cone is attached to a 3.0-inch (76 mm) diameter, edge-wound, copper-ribbon voice-coil and a 5.6pound (2.54 kg) ferrite magnet, producing a gap flux density of 1.3T. The high frequency compression driver features a 2.5-pound (1.13 kg) ferrite magnet having a gap flux density of 1.6 T, and a 1.75-inch (45 mm) diameter, edge-wound, aluminum-ribbon voicecoil. This voice-coil is attached to a high grade aluminum alloy diaphragm having a tangential compliance. Sound waves from the high frequency voice-coil and diaphragm assembly are channeled through our Radial-Wave™ Phasing System into an exponential throat. This throat actually passes through the center of the low frequency component, exiting through a one-inch (25 mm) diameter aperture into our new high-frequency horn, which provides accurate delivery of frequencies from 1,500 Hz to beyond 20 kHz. We also recommend our optional N604-8A Crossover Network for the 604-8H-III, which divides the audio bandwidth into two sections, using a minimal-parts-count design. The electro-acoustical division is centered at 1,500 Hz, with this crossover providing 12dB/octave of attenuation for both the low frequency section and the high frequency section. It was designed specifically with our new horn to provide an extremely accurate frequency response that extends beyond 20 kHz.